Few musical figures in this century, absent involvement with the Hitler regime, or some catastrophic health crisis, led careers as exalted and successful at one end, as lucrative in their center, and as tragic at their end as Erich Wolfgang Korngold. Exalted in some Viennese circles before the age of 10 as a second Mozart, he outlived that premature media stardom to become a respected serious composer and a notably successful composer of opera. His name evoked the best that melodic, tonal music had to offer in the 1920's and 1930's--and then he found his way to Hollywood, and the welcoming arms of Warner Bros. Studios, and became the most important composer ever to make a home and career in the movie capital. Korngold was born in Brunn, in Moravia (now Brno, Czechoslovakia) in the Austro-Hungarian empire on May 29, 1897. He was the son of Dr. Julius Korngold, who was one of the most influential music critics in Vienna. The elder Korngold was a controversial figure--Jewish, a conservative figure (who abhored atonalism and the whole Second Viennese School), and possessor of an acid-tipped pen in a city rife with intellectual and political ferment and rivalries and an undercurrent of anti-Semitism, Dr. Korngold made his share of enemies with his influence. Julius Korngold (1860-1945) was, himself, a frustrated composer who had studied part-time at the Vienna Conservatory even as he prepared for a legal career--his harmony teacher was Anton Bruckner and his fellow students included Hugo Wolf and Franz Schalk. A career in music was out of the question for Julius Korngold, whose family entertained intentions of a respectable livelihood for their son--in compensation for his thwarted desires, he began writing music criticism in Brunn, and managed to endear himself to Eduard Hanslick, then the most influential critic in Vienna. Korngold became a protege of Hanslick's, his assistant by the 1890's--by which time he and his wife Josephine had two sons--and ultimately his successor. Erich Wolfgang Korngold, the second son, was reportedly beating time with a spoon by the age of three, and playing basic melodies at age five. Hanslick himself had referred to him as the "little Mozart," and the boy seemed to rise to the occasion by starting to compose at the age of six. The elder Korngold brought his son at age eight to see Gustav Mahler, who, after pronouncing him a "genius" (in the words of Alma Mahler), strongly encouraged the father to continue his son's training and recommended that he study with Alexander Von Zemlinsky. Within a year, Korngold had written what became his formal Opus 1, a Piano Sonata in D minor, and a year after that a ballet entitled The Snowman. It was during this period of his life, when Korngold was not yet 10 years old, that he even managed to impress the Emperor Franz Josef with his precocity. 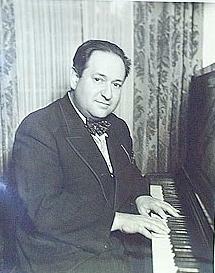 Despite a sometimes willful nature and a lack of maturity that made him difficult to deal with, Korngold seemed lead a charmed musical life--when he was 13, his second Piano Sonata was premiered by Artur Schnabel (who kept it in his repertory long after), and Bruno Walter and Arnold Rose were two of the players who premiered his Piano Trio, Opus 1. Some of the joy that he might've found in these successes was muted by the whisperings of his father's enemies. The elder Korngold was known as a big supporter of his son's career, so much so that it was rumored that he--and not Erich--had written these pieces. Additionally, the father's support led to resentment on the part of members of the music community who, while conceding that the younger Korngold was talented, didn't enjoy the idea that doing anything less than welcoming his music enthusiastically would provoke a negative reaction from the elder Korngold. Depending upon whose accounts one reads, Richard Strauss was either a wholehearted supporter of the boy's career, or intrigued but somewhat wary of his talent. Korngold's career on the operatic stage began with a one-act piece, Der Ring des Polykrates (1914), which he followed a year later with another operatic work, Violanta. Korngold was not yet 20 when he enjoyed acclaim for these two works, of which Violanta has endured rather longer in the repertory. By that time, the First World War had broken out, and Korngold was drafted in 1917, but exempted from combat and, instead, made musical director of his regiment. During the next three years, the Austro-Hungarian Empire was defeated and dismembered, and the aging emperor who had delighted in his talent as boy died. Even as his world's axis shifted and his country died and was reborn, Korngold continued working, and in 1920 completed his most celebrated operatic work, Die Tote Stadt, which was an immediate hit in Cologne (where it was premiered under the baton of Otto Klemperer) and the rest of the German speaking world and quickly entered the repertory of Covent Garden in London and the Metropolitan Opera in New York. Korngold by now had overcome any suggestion of his father's influence as a cover of any lack of quality in his work. He would never entirely overcome the resentment left behind by his father's early assistance, however. Additionally, he was also placed in an awkward position by the increasing controversy of his father's opposition to the 12-tone system of composition. During the early 1920's, Korngold began a new phase of his musical career when he agreed to prepare a new performing edition of Johann Strauss's operetta Eine Nacht In Venedig. The work had some gorgeous music but had never been a success, mostly owing to its substandard libretto. Korngold revised the libretto, reshaped some of the musical material, and transformed the operetta into a success for the first time in its 40 year history. Korngold's output of new music during the 1920's included more chamber works, a concert overture (Surdam Corda), and the opera Das Wunder der Heliane. The latter, premiered in Hamburg on October 7, 1927, was his first notable critical failure. In contrast to the rich melodic nature of his earlier works for the opera house, Das Wunder der Heliane was a work steeped in mysticism and a subdued drama. Critics and audiences were disappointed with the work, and it fell out of the repertory very quickly, although the composer always regarded it as his finest operatic work. Much more fateful for Korngold was the beginning of his collaboration with theatrical producer Max Reinhardt in 1929, in a new production of Die Fledermaus. In 1933, Reinhardt brought his stage production of A Midsummer Night's Dream to the Hollywood Bowl, which so impressed executives at Warner Bros. that they engaged the producer to bring it to the screen. He engaged Korngold to arrange the music. What Korngold ended up doing with A Midsummer Night's Dream was similar to the editing he'd done on Eine Nacht In Venedig. Ideally, Reinhardt wanted to reuse Mendelssohn's music for the movie, but there wasn't enough of it to underscore a movie running more than two hours. Instead, he introduced other Mendelssohn works into the score, as he had with Strauss's music in the operetta. A Midsummer Night's Dream wasn't a financial success, or even much of an artistic triumph, but Korngold's handling of the music did impress the management at Warner Bros. Ever since 1932, when Max Steiner had revolutionized the notion of scoring sound films, every studio had been looking for its own Steiner--ultimately Warner Bros. would get the man himself under contract, but in 1933 Korngold fit the bill exactly for the kind of composer for whom they were looking. It not likely that Jack Warner, the head of the studio, knew or would even have enjoyed Korngold's operatic or concert works. Like most of the moguls, he was a self-made man of limited education and very narrow experience outside of business, none of it involving serious music. But Korngold's was a name that carried a great deal of respect he had done more with the music for A Midsummer Night's Dream than anyone had expected, and more than any Warner Bros. movie (other than the studio's musicals) had done with music since sound had come in. And Warner and his executives liked the music, even if it was Mendelssohn's and not Korngold's own, and the fact that Korngold appreciated the need to work quickly. He was too well established a composer to be approached in the way that Steiner or his contemporaries, most of them immigrants trying to find security for themselves in America, had been-- Korngold was already a success, and had a home in Vienna. In fact, one of his stage works, a pastiche of Johann Strauss music that he'd put together into a quasi-biographical narrative called Waltzes in Vienna, had already been filmed in England (by no less a director than Alfred Hitchcock, though the director and most scholars regard it as perhaps his worst movie) and was making the rounds as a property in Hollywood, where it would ultimately appear as The Great Waltz (1937). Warner Bros. offered him a one-year contract, which he turned down. He was later offered a contract with Paramount, through Ernst Lubitsch, to score a musical entitled Give Us This Night. In the end, between the offers and the counter- offers with which he was presented, Korngld ended up working on two films simultaneously--Give Us This Night (1935) for Paramount, and Captain Blood (1935) for Warner Bros. Captain Blood delighted both the studio's executives and the movie's large audience. Korngold's music added a richness to the adventure epic's sweeping tale of heroism and triumph over injustice that startled viewers with its inventiveness-- the music's presence lent an extra dimension to the drama, excitement, and beauty of the movie, almost as surely as if it had been shot in Technicolor. In the end, he signed a contract with Warner Bros. that was one of the most generous ever offered a composer in Hollywood. He was free to refuse any project, and to get the first choice of any movie on the studio's schedule. Korngold's third score for Warner Bros. was Anthony Adverse, an epic bestseller that was one of the most ambitious movies in the studio's history. It also won Korngold his first Oscar. In between Captain Blood and Anthony Adverse, Korngold wrote and arranged the music for the all-Black cast movie fantasy Green Pastures. The studio hadn't thought the European-born Korngold the natural choice for this film, but he loved working with the script and the spirituals that comprised much of the score. It was while working on the film that Korngold also revealed something of the naivety in his nature that could be very troubling to those around him--he failed to understand why the Black cast members of the film didn't eat in the main studio dining room, and had to be told about the segregation that existed; he subsequently declined to eat in the dining room, embarrassing all of those around him in the process. Yet, that same naive nature about politics and human nature also put him and his family at real risk. Despite his enjoyment of the climate in California and his appreciation of the very high salary he was paid, Korngold's real desire was to return to the opera stage in Europe with a triumph. This was to have been Die Kathrin, which was to be premiered at the Vienna State Opera. Unfortunately, even as the production was in preparation, political events in Europe were making it increasingly clear that Austria would soon join Germany as a locale closed to Jews. Korngold's contract with Warner Bros. had run out in 1937, and he returned to Vienna. He had been offered a new contract by the studio, and the chance to score The Adventures of Robin Hood, the newest costume movie starring Errol Flynn, who'd been introduced to American audiences as the star of Captain Blood. The composer had looked at the script, however, and turned it down, believing that there movie had too many sword fights and other action scenes, which would distract people from any music that he might compose. Korngold had hopes as late as the beginning of 1938 that his real future lay in Austria. Luckily for him and his family, reason prevailed. The German troops on the border were an ominous presence, and no one doubted that if the Austrian government didn't agree to annexation--which, to its eternal credit, it didn't--that Hitler would carry it out by force. Korngold accepted the offer of the film and the contract, and got his father and the rest of his family out of the country and safely to Hollywood with only days to spare. The score for Die Kathrin was smuggled out of the country after the work was banned by the Hitler government, its pages hidden between the pages of other music manuscripts (the opera was eventually premiered in Stockholm a year later, but didn't really find an audience of any kind until the 1990's). Korngold was now in Hollywood for the long haul, and he acquitted himself marvelously--indeed, the Robin Hood score that he hadn't wanted to write earned him his second Oscar. He was looked on with jealousy by some contemporaries, at Warner Bros. and elsewhere, who worked on as many as six or seven feature films a year while Korngold did his two. Additionally, Korngold was the only composer on the Warner Bros. lot, and perhaps in all of Hollywood or in the entire world's movie industry, who had sufficient stature and respect that he could go to a director or the head of the editing department and ask for a few extra seconds of film in a particular scene or shot, to make his music work better. Additionally, his contract required that Korngold's name be credited with its own separate frame in the movie's main titles, and that his name be included in any advertising or promotional materials that mentioned the name of the director. What made Korngold special, of course, was his music. He described his movie scores as "operas without words," and at their best, those scores served the same function that underscoring in an opera did on the stage, and then some. In this music for The Sea Hawk (1940), for example, he helped elevate the movie to a level of seriousness suggested in the script, but never stated outright--that the Elizabethan struggle against Spain and the Armada was the precedent for the contemporary British resistance to Hitler's pending invasion; he even found room to express a subjective appreciation for beauty on the screen, the love theme for Brenda Marshall's heroine being one of the most achingly, passionately, quitely gorgeous pieces of music to appear in a Hollywood film to date; yet, at the same time, he never lost sight in his music of the movie's costume-adventure nature, or its need for a rousing underscore to the acts of derring-do of Flynn's Captain Geoffrey Thorpe. Korngold's music could be bold and passionate, as in Kings Row, or subtle and romantic, as in the case of The Constant Nymph, but it was always polished. It was often difficult to tell where his movie music ended and his concert work began, on those rare occasions where they did overlap--the final movement of his Violin Concerto uses some of the same material found in his score for the 1937 film The Prince and the Pauper, but it isn't clear which borrowed from which, as their compositions overlapped (though the concerto didn't surface until the 1940's); and no one ever complained about the overlap. Korngold was in Hollywood for a total of 14 years, during which he scored 17 films, 16 of them for Warner Bros. During that 14 years, the Third Reich came and went, and the world changed, and Hollywood with it. He was grateful for the refuge it had given him and his family, but he wanted to return to Austria. Additionally, there weren't too many movies still being made in Hollywood of the kind that Korngold liked to score--a new, postwar realism was taking over, which didn't lend itself to the kind of dense scoring and melodic richness that were Korngold's forte. He left Hollywood in 1947 and returned to Vienna, and thus began the final, bittersweet chapter in Korngold's life. He discovered that he was either forgotten, ridiculed, or actively resented in the city he'd thought of as his home--forgotten by audiences destroyed by seven years of Nazi rule and four years of Allied bombings; ridiculed by the music inteligentsia, who regarded his tonal music as hopelessly outdated; and resented by a populace who'd endured bombings and starvation (which was still going on) while Korngold and his family had safely exiled themselves to Hollywood and a life of luxury (they overlooked the fact that Korngold and his family would almost certainly have ended up in concentration camps--and also ignoring the idea that anyone but a dedicated Nazi would have refused the guarantee of a good income and a welcoming employer in a city where the sun shined more than 300 days of the year, for the chance to live in a city occupied by goose-stepping soldiers). Wilhelm Furtwangler, the most revered conductor in the German-speaking world, tried to pave the way for Korngold's return, conducting the premiere of his Serenade for Strings with the Vienna Philharmonic in 1950, but the critical reception was cold. A revival of Die Tote Stadt in Vienna was announced and then cancelled, and Die Kathrin, which had never been seen in the city for which its premiere had been intended, was also cancelled. Korngold continued writing, and in 1950 finished his last major concert work, his Symphony. Again, it was neglected in his homeland, even the symphonic genre by then regarded as archiac, although it slowly found an audience elsewhere in Europe. He returned to the film world one last time in 1954, at the behest of director William Dieterle (who had co-directed A Midsummer Night's Dream), to score the movie Magic Fire. A rushed dramatization of the life of Richard Wagner, the German-made film's best element was the music, which was summarized in reasonably eloquent fashion, despite the need to heavily edit every piece of music represented (the most extreme example of which was the closing montage, in which Parsifal is represent by about ninety second of music and footage). Korngold's health began to fail in 1957, and he died late that year. At the time of his death, ironicaly, Lionel Newman had just conducted a modern re-recording of excerpts from some of Korngold's most celebrated movie music. Over the next 15 years, his music would grow in prominence and recognition as the movies for which it had been written, including Captain Blood, The Sea Hawk, The Adventures of Robin Hood, and Kings Row, got a new round of exposure on television (Warner Bros. had sold out its TV rights in 1955) and in repertory and revival theaters. By the dawn of the 1970's, Korngold's own son, George, now a producer, had prepared a new album of modern re-recordings of his father's best movie music as part of RCA-Victor's Classic Film Scores series, featuring Charles Gerhardt conducting. In the decades since that time, new recordings of complete Korngold scores have started appearing a amazing regularity from a multitude of labels, includig Bay Cities and Varese Sarabande. Additionally, the rediscovery of Korngold the film composer has led to a fresh round of recording of his concert work, as well as new performances--in 1996, John Mauceri conducted the New York Philharmonic in the first New York performance ever given of Korngold's Serenade for Strings. For many years, Die Tote Stadt was virtually alone among extant Korngold works on record, the RCA-Victor recordings by Erich Leinsdorf having grown out of a mid-1970's revival of the opera at the Metropolitan Opera. Rudolph Kempe had recorded the Symphony in the early 1960's, which bounced in and out of print for decades. It has since been joined in the catalog by at least two additional recordings of the Symphony, and much of Korngold's chamber music has now been recorded along with Die Kathrin and his other operas. The result, coinciding with the Korngold centennial year of 1997, was more of his music becoming available for the hearing than at any time in history, virtually his entire published output of major works.